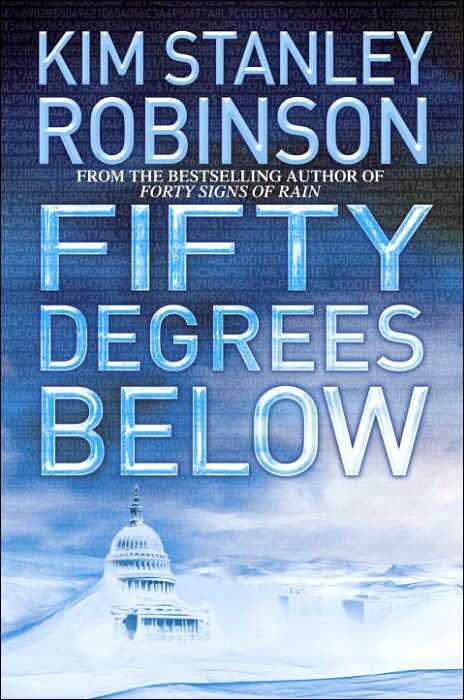 Fifty Degrees Below is the second novel of the Science In The Capital trilogy. It explores the main characters in Washington, D.C. throughout a very cold winter following the halting of the Gulf Stream due to abdrupt climate change. Compared to the previous novel, it is mostly focused on the character of Frank Vanderwal. As Washington, DC, recovers from a flood, climate change becomes more of a cntral issue in the intricate interaction between science and politics. Frank Wanderwal now homeless, he decides to live in a tree house -- just as the Northern hemisphere experiences the coldest winter in recorded history. It was published in 2005, a few months after the passage of hurricane Katrina and the destruction of New Orleans: real-life images that were echoed greatly ex ante by the flood of Washington described in these novels. Like all three volumes in this trilogy, the novel is divided in ten parts. Each part begins with a short incipit (in italics), often unrelated to the main characters and told from a different or omniscient point of view. The part then contains short chapters, each focused on one of the main characters (essentially Frank and Charlie) and narrated in the third person. Each chapter thus follows a storyline that develops simultaneously with the rest of the part’s chapters. Fifty Degrees Below focuses much more on the character of Frank compared to the first volume. After the massive flood on Washington in May, life has taken its course again in the nation’s capital, just as before. Or so it would seem. Frank Vanderwal is now homeless. He leases a van, in which he sleeps; he subscribes to a fitness club, where he showers; he spends more hours in the office and outdoors: his new house is spread all over the city! He takes frequent walks at Rock Creek Park where he befriends a group of homeless (“the Bros”), with whom he hangs around and plays chess, and a group of fregans, with whom he plays running Frisbee golf; he joins the Feral Observation Group which monitors the animals of the zoo that were freed during the storm. Following his precepts on repaleolithization, he builds a treehouse in the Park where he spends his nights. The “Vanderwal committee” of NSF begins work on climate change mitigation and adaptation, with meetings (NSF teams, diplomats, UN, EU Emissions Trading Scheme, IPCC...), grants decisions, policies evaluations, proposals examinations, reading abstracts, To Do lists, discussions of renewable energy, carbon capture methods, biodiversity... Cascade theory: what is the best funding decision that will have the most impact? Diane’s bold leadership causes warring between agencies and regulatory capture reveals itself. By exercising at the gym, working and travelling together, Frank and NSF boss Diane Chang grow very close together but keep their distances because of the difference in hierarchy. At noons Frank goes running with colleagues market analyst Edgardo and climatologist Kenzo. Frank has to deal awkwardly with his ex Marta when discussing with her and Yann’s work at Small Deliveries Systems (SDS) in engineering tree lichen that capture carbon into the host tree; using NSF funding, Frank starts an institute paired with UCSD to make use of this bio-engineering expertise. SDS then gets a contract from Russia to do a field trial of the genetically modified lichen in Siberia: the carbon drawdown is much larger than expected. The North Atlantic project to restart the Atlantic thermohaline circulation (the Gulf Stream) by dispersing salt in the ocean finds financing through major European re-insurance companies. While the West Antarctic Ice Sheet completely comes off and increases sea level, the vast fleet of the world’s first planetary engineering project is launched. Charlie Quibler convinces Senator Phil Chase to run for President, which he announces at the ice-less North Pole, on Midsummer Day. The Quiblers and Frank visit the original Khembalung, an island off Bangladesh; Joe is very excited and is the focus of much interest from the Khembalis, and Joe’s general change of temper worries Charlie a lot. A monsoon flood ends up breaking the dikes surrounding the island and the entire population has to be evacuated: the Khembalung population moves to Washington. Rudra’s assistant Drepung reveals to Charlie that he is, in fact, the real Khembali in charge, not Rudra. Charlie becomes convinced that some stronger spirit has come to occupy Joe’s body and he pleads for some kind of exorcism in order to have the old Joe back. Anna complies despite her all-scientific disbelief, and the ceremony is performed with what appears to be success. Frank meets his mystery woman, Caroline: she is in fact part of a Homeland Security-related team that does surveillance on anyone related to Yann Pierzinski, as his work is valued in people/ideas futures markets, markets born in Defense department R&D but that now have drawn the interest of various investors and shadow surveillance groups; she had been following him, not the other way round! They agree on a system to communicate discreetly and share moments in Frank’s treehouse. Caroline advises Frank how to get even more under the radar and provides him with a wand that detects bugged and chipped items in his belongings. Caroline is concerned of her estranged husband, who is also in the surveillance business. Caroline reveals that the technology exists to tweak voting machines; she provides Frank with the algorithm and he shares it with Edgardo. She later calls in emergency: she quarreled with her husband and has to leave and assume a new identity. Frank allows Caroline to escape by metro and draws those following her (her husband among them) to a chase through the park; with the help of the Bros and a bit of uncharacteristic boldness, he scares them off. As the weather grows colder, Frank wears his mountaineering gear, “high-tech paleolithic” style, and provides tarps and clothing for the Bros. Frank gets hit on the head when he tries to defend the Bros from outside attackers; this leaves him a permanent taste of blood, and worries that he’s had permanent brain damage because of what he perceives to be a decreased ability to take decisions. The cold snap: the USA and Europe experience their coldest winter. Frank actually finds rapture in the cold and enjoys applying altrusim, by rescuing people, helping clearing damaged areas, surveying the feral animals next to the heat boxes that were installed. However, cold has the best of him and he has to move in with the Khembali’s new embassy house in Arlington, sharing his room with Rudra; as Frank helps the Khembali with gardening and cooking, he and Rudra teach each other their respective languages and discuss Buddhism and game theory. Spring arrives. With the Presidential campaign gearing up, Anna pushes the idea of bringing science back to policy: the SSEEP (Social Science Experiment in Elective Politics) project is created in which a virtual candidate expresses scientifically sound viewpoints; Chase embraces SSEEP’s proposals. NSF’s age of innocence ends as the SSEEP experiments declares Chase as the “best real current choice” as a presidential candidate. Phil Chase is elected President of the USA and the Quiblers celebrate. But Frank is not satisfied; he talks with Rudra about the schizophrenic optimodal life he’s been leading. It is difficult to be a whole person. Frank Vanderwal: Head of the so-called "Vanderwal Committee" of NSF, created to examine climate change mitigation and adaptation. Homeless, settles in a treehouse in Rock Creek Park that he built. Anna Quibler: Director of the Bioinformatics Division at NSF. Charlie Quibler: Environmental policy advisor to Senator Phil Chase. Phil Chase: US Senator, nicknamed the World's Senator because of his globe-trotting past. Presidential candidate for the Democratic party. Diane Chang: Head of NSF. Caroline: Did surveillance on behalf of Research and Development Agency Prime, an agency associated with Homeland Security. Wife of Edward Cooper. Re-read this March 2016. Enjoyed it even more. It is even more true. Entangled with characters. Is there a sequel? What happened to Frank and Caroline, little Joe? The Tibetans? KSR, you are the best!